Draught Beer - THIRST FOR KNOWLEDGE® INC. In recent years, we've seen a massive shift change in the consumption of beer. While draught beer is a beautiful way to romance and showcase beer, it is in decline worldwide. The onset of a baby boomer generation who is starting to cocoon and entertain at home is having an effect on the amount of draught beer consumed at bars and restaurants. On top of that, responsible use of alcohol programming has made the populace more aware of the amount of beer that can be safely consumed. In addition, many draught beer purveyors simply do not have the knowledge to properly pour and serve draught to consumers. Draught beer at its finest can be the best beer you'll ever get. Conversely, poor draught beer can drive a beer lover to switch to other drinks. 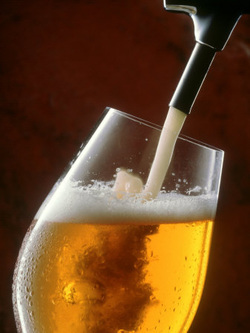 Draught beer should be poured at the right temperature into the appropriate glass (branded if possible) with at least 2 fingers of foam.